In November, 2017, the Delaware County Historical Society celebrates its 70th birthday. The Society is dedicated to providing educational programs and services to the public, thanks to the support of our members, donors, and the Delaware County Commissioners. This article traces the Early Years of The Society from 1947 through 1997. In May of 1947, a group of history buffs had tentatively organized the Marlboro Historical Society, but it was decided that the organization should be enlarged to include the whole of Delaware County, and to change the name to the Delaware County Historical Society. 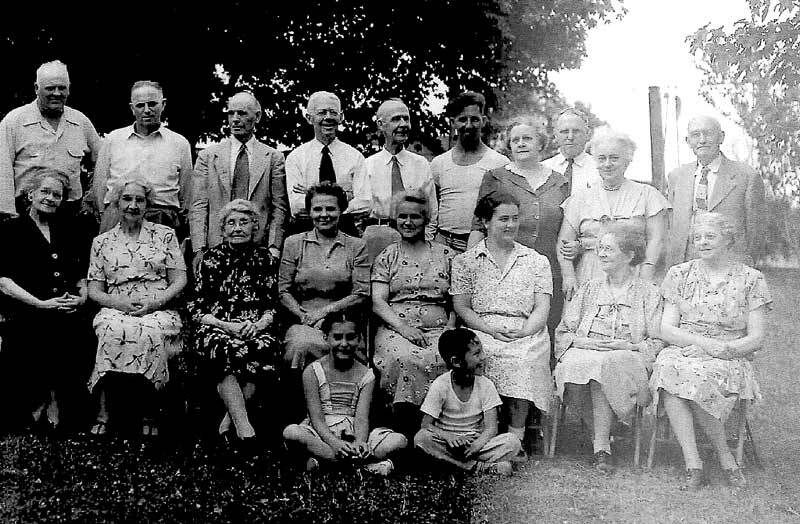 Urged by Mrs. Walter S. Cole, a number of persons interested in the history of Delaware County met in the old Marlboro Church on October 12, 1947. By November a constitution was written, the Society incorporated, and by November 17, 1947, the first officers were elected. It was approved that the two officers of the disbanded Marlboro Historical Society be officers of the new Society: Mr. Wilbur J. Main, president, and Mrs. Genevieve (Walter S.) Cole, secretary. Mrs. Edgar Nichols was elected as treasurer. The Society had its first picnic on October 16, 1947. According to a note with the photo(above), the picnic was “held at Mr. & Mrs. Nichols”. There are 18 adults and two (2) children are in the photo, and we are still trying to identify the names of everyone in the photo. An early vision of the Society was to have participation from the city of Delaware and from each of our townships. We had a larger Board at that time. In December 1948, the Society elected six officers, 18 trustees from the townships and four (4) trustees from city wards. The William Street Methodist Church. The Society met regularly and held programs for members and the general public during the academic year at various churches and schools. Each year, at least one program was held in a surrounding village or township. Although a newsletter was not published until 1971, starting in 1952 there was a one- or two-page letter from the president or another Society leader every month from September through May. The letter summarized the last program and announced the details of the next program. The annual meeting was held each spring. It was the occasion for the election of board members and included a presentation and dinner. The 1956 Annual Meeting was on May 28. Each attendee paid $1.50 for a Swiss steak meal, and a presentation entitled “Museum Collections – Showplaces or Attics”. In 1954 Pauline Nash (1895-1975), gifted her home at 157 William Street to the Society. The terms of her gift included a requirement that she receive a modest annuity of $780 per year for the remainder of her life. She was active in developing the house into the Delaware County Historical Museum, which celebrated its grand opening on May 22, 1955. There were 500 people who visited the museum on opening day. Coincidentally, the Society had about 500 members in 1955. Pauline was our lead “hostess” for many years, and she also served as the Society’s secretary. Even in those early years, it became evident that more space was needed for museum storage and exhibits. The Museum Annex, today known as the Research Library, was built in 1971 for $26,000 on an 18-year loan. Thanks to generous donations from members and the community, the loan was paid off in only five years. By 1976, library materials were moved from the Nash House to the Annex. The Nash House was “revitalized” and “redecorated” in the mid-70s under the leadership of President Larry Ratcliffe, trustee and curator Marilyn Moseley Cryder (1931-2010) and other society leaders. Improvements were made possible by a Gund Foundation grant received through a 1976 Bicentennial program. John H. Reed (1923-2015), Society trustee and Ohio Wesleyan University archivist, was the primary grant writer for the project. The grant provided funds to “OWU with matching funds provided by groups and individuals from the community, and personnel / resources from the university”. Selected OWU students earned academic credit and at the same time enriched the holdings, displays and facilities of the Society. The Society held an open house on Saturday, May 6, 1978, according to the event’s invitation, of the “Annex” and the “1880 Town House – Nash Residence” to “review new displays and improvements in the facilities”. In 1986, responding to growing interest in family history, the Society helped found the Delaware chapter of the Ohio Genealogical Society. For years, the two societies maintained their headquarters at the Annex. George and Marilyn Cryder served in many capacities from 1972 and into the twenty-first century, leaving a long legacy of leadership in the Delaware County Historical Society. The Cryders were well-known in the community as a resource for important historical questions. George R. Cryder (1924-2002) was president of the Delaware County Historical Society from 1985-1994. The Society accepted the donation of the Mendenhall Title Index in 1996. Edward M. Mendenhall was a title agent, and for a time was our county surveyor. Mr. Mendenhall personally indexed property transfers by handwriting pertinent information on 4” x 9” cards, and filing them in order by legal description. By reading one or more cards, a researcher can easily trace the seller (grantor) and buyer (grantee) of a parcel of property through most of the nineteenth century. Today, property-related research questions continue to be among the most frequently received from the public. We hope you enjoyed learning about our Early Years and will want to view / read more. As part of our 70th Anniversary celebration, we have added About – Our History. There you will find images, videos and documents of activities and individuals from our rich past. Take a look at the 9-minute Video Summary of our History. You may also be interested in reading “Looking Back On Our First 70 Years” in the Delaware County Historian, Spring 2017. Coming Soon, watch for a Timeline our 70 years of events and activities, through pictures and news-clips.